So just what is the 21 day sugar detox? This is a food based program designed to reduce and eliminate cravings for carbs and sugars. If you’re like me and have diabetes, you’ve been used to eating all the wrong foods for years. Sugar buildup is what contributed to or caused my diabetes. I never thought about what I was eating as long as it tasted good and I liked it. Is this you? Sound familiar? Well it’s not until something is diagnosed or there is a problem with our health that we finally sit up and take notice. I’ve tried many diets not realizing that the biggest contributor to my weight gain and diabetes is the simple carbs and sugars I out into my body. If you’re not reading labels and being aware of what it is foods, then you have no clue as to how much sugar is in the food that you eat. Now it’s important to know what the 21 day plan is all about. It’s about removing the sugars and detoxing them from your body. It’s not a permanent “diet” per say. Once I got started with the plan I began to realize that I was feeling better without all that sugar inside my body. And it’s not just about starting and completing the plan. Once you’re finished it might take you more than three weeks but a new plan must be in place. That’s what this is really about. While the plan focuses on eating the good carbs (complex carbs) and healthy fats and proteins, it’s going to be a permanent healthy eating lifestyle for you so that the 21 day sugar plan is completed only once. So what will you experience and notice after completing it? You will have more energy, better sleep, and be focusing on things much more clearly. Once you’ve broken away from the bad habit of eating sugars and carbs, you won’t be craving them anymore because the more you are eating them the more you crave them. I’m not saying that this is the plan for everyone because it’s not. But for me and a lot of diabetics it does work in taking control and eventually lessening and controlling your blood sugars and diabetes. It’s up to you to decide, so the choice is yours. I made my choice and it was right for me. I will just mention what’s inside, talk about the author Dian Sanfilippo, and list the three different programs that are offered. The bottom line is what is best for your particular health. That’s my concern. Everyone should be healthy. Diane started out like most of as kids craving sugar and candy. She begins by asking 10 questions to determine if you need sugar detox. And trust me, I answered yes to WAY more than one! It was fascinating to read about what sugar does to you both short term and long term. Diane holds a Holistic Nutrition Consultant certification obtained from Bauman College in Berkley, California, a CHEK Institute Holistic Lifestyle Coach certification, a Poliquin Biosignature Modulation certification, and a Bachelors degree from Syracuse University. According to her Linkedin page, she also specializes in dairy free, gluten free, paleo and soy free nutrition. Her credentials also include a New York Times bestsellers list book called Practical Paleo. She is also found on all the social media websites such as: Youtube, Pinterest, Google Plus, Twitter, Facebook, and Instagram. Diane is a real life professional person who offers to help people with nutrition and guides you into sugar detox. There are people who are scammers and with her credentials Diane is definitely not one of them. You can begin the sugar detox program by downloading the quick start guide ebook. You can meet your goals by viewing the videos included. If you need help and motivation, you can access the community and talk to other members. 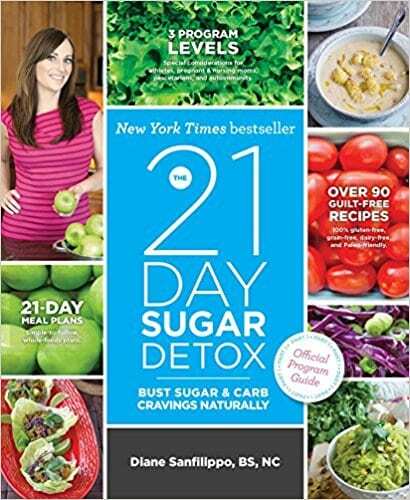 21 Day Sugar Detox hard copy book which contains 240 pages (color) – 90 detox recipes inside. It’s only $14.95 including free shipping (in the US) as opposed to being $34.95 on Amazon. 21 Day Sugar Detox Cookbook which contains 240 pages with over 190 recipes illustrated in full color. Again as in the plus package, it’s only $14.95 including free shipping (in the US) as opposed to being $34.95 on Amazon. It could take longer than 3 weeks if you’ve been a sugar fanatic for so many years, so don’t get discouraged by taking a short time of and then repeating. For some people it will take longer to detox. That’s reality for some of us. Stay committed and stick to the plan. Don’t go off it or “cheat” because you’ll only be “cheating” yourself. You are taught to rid your body of sugar, not to teach you what and how to eat afterward. Diane explains that what eating lifestyle you choose is up to you. It’s like starting fresh and wiping the slate clean. After you complete the program you should be and feel a lot better and then changing to a healthier lifestyle will keep you that way. What is 21 day sugar detox diet then? So it is not really meant to be a diet, but a plan to detox you from the sugar. It’s imperative that you realize that the sole purpose of the 21 day sugar detox is just that, detoxing from sugar. Once you decide afterward as to what diet or healthy eating you choose, it makes it easier to stick with because you’re not taken back by the cravings of carbs and sugars anymore. Sugar can wreak havoc on your body and once you understand more about sugar, then it will be clearer about how it affects you. Once Diane explains specifically how sugar is broken down, the types of sugar, and then learning how to defeat the sugar cravings for good, you will want to do this detox program. There are so many sugar free recipes on the 21 day plan that you shouldn’t be concerned and worry. They look anything like food that is detoxing or dieting. You’ll have breakfast, lunches, dinners, and snacks that won’y make you feel left out or like you’re missing something. The 21 day plan includes meal plans and if you don’t follow it exactly, you’ll at least know how to plan your meals accordingly. But it’s more beneficial to follow the plan to get the most benefits from it. It’s amazing what artificial sweeteners can do to you and they were eye openers for me! I kicked the artificial sweeteners out for good. And it’s important to know what carbs are good and which aren’t good. The 21 day sugar detox is a program designed to help you deal with and dismiss bad carb and sugar cravings in a time period of three weeks or a little more. The goal is to gain other healthy benefits by turning around your bad eating habits. The plan is to have healthier food choices take the place of the sugary high carbohydrate junk foods and to get your diabetes in control. I would appreciate any comments you may have. You can leave them below. Two heads or more are better than one! Thank you! We are a participant in the Amazon Services LLC Associates Program, an affiliate advertising program designed to provide a means for us to earn fees by linking to Amazon.com and affiliated sites. This is at no extra cost to you. As a health coach, I do sugar detoxes all the time and I really like Diane Sanfilippo’s! Your article gave a great overview of the program and its benefits. I highly recommend that people take the time to do a sugar detox, it’s almost a matter of life and death. Great info and I hope people give it a go! Yes Diana has all the credentials and has written several books. Sugar is the enemy and people don’t realize what it does to you. Sugar detox is great for starting over. I feel that people with high sugar numbers and diabetes should give 21 Day sugar detox a try. Hi Rob,thanks for your informative sharing about the Diane’s detox program. We will need sugar in our body, but excessive sugar level will lead to many health problems. This program can be a good way to start taking a balance sugar in our daily diet. Is the diet recommended is targeted to certain age group? The 21 day sugar detox program by Diane Sanfilippo is great. It can change your life. Once you’ve completed it you just have to choose how your eating lifestyle will be in the future. It is not targeted to any age group, but it’s still recommended to check with your physician first no matter what the age. I follow a ketogenic lifestyle and I know about try to keep my carbs and sugar as low as i can get them. Your article is very informative for people who are looking to lower their blood sugar levels, and i think this book would be a great help to someone starting out on a sugar free lifestyle. Lowering blood sugar for a diabetic is important. 21 Day Sugar Detox really helps with getting the sugar out and starting over. It’s a good start toward defeating diabetes and being healthy too. Great info about this plan to detox sugar from the body. Having too much sugar in the diet can really be dangerous to our health. Itâ€™s good to know that this 21 day plan does not only include all 3 meals for each day, but also snacks. This plan seems to be a healthy choice to take the place of a high sugar and carb diet. We never think about too much sugar until it affects our bodies. When it gets serious, then it’s time to take action. The 21 day sugar detox plan can turn things around. Once the sugar is gone, it’s time for a fresh start. Out with the sugar, in with better health. My mother is diabetic and I have seen her go through a lot over the years. Diet is the toughest obstacle she faces while living with this. Blood sugar levels are hard to maintain when living with diabetes and I appreciate you bringing this product to my attention. I love the fact that it is a 21 day program because you have a timeline in mind and you can build some great habits. It makes things so much easier when you have the whole plan written out for you with plenty of options. I like the fact that Diane has credentials and is obviously knowledgeable about this subject. This product looks like it can be extremely beneficial for anyone struggling with diabetes. Diane has been very successful in helping people achieve the goal of sugar detox. I believe that diet is the biggest factor with diabetes. If you’re eating sugar foods or foods that you don’t realize contain sugar, then your result is diabetes. Following the 21 day plan helps you get on the right track. Once you’re done, it’s a new eating healthy lifestyle. Thanks for your comments and I hope your mom gets her diabetes under control. Sugar is one of the things that cause so many health issues. Eliminating sugar from your diet is a must for good health. I like your review of a product that can coach you through the process and encourage and educate. Also as you say this is not a diet it is a life change. This is one of the things I always tell my clients when I am coaching them. Healthy eating is a lifestyle not a diet. Wow! What great information and great review! As a diabetic, this stuff hits close to home. I’ve been having a rough time with the cravings, and this book and program could literally be a lifesaver for me! I’ve seen this book (or rather its cover) before, as people have told me about it. However, your review gives me better insight as to exactly how it could help me. Thank you so much for sharing your review! Yes the sugar cravings can be terrible. Detoxing from the sugar seemed to be the best solution for me. Sugar is just so bad for you and it took diabetes to make me realize that. But at least there are solutions and the 21 day detox is a big help. Now I have changed my eating habits to healthy ones with more fiber and less simple carbs. I hope that it helps you as well! I’m pretty sure I have a predisposition for diabetes because several family members have that diagnosis. Lately, I started putting on weight and my will power has been very weak. I feel like I’ve been more on a “see food” diet. The last few weeks, I’ve started to think about how I could make some changes to improve my lifestyle, including what I eat because I don’t like the way I feel. I want to go back to how I felt last year. Your post is giving me some hope that I can make those changes and get some ideas of foods that will help me prevent diabetes and improve the way I feel. I also like that you mentioned that Diane’s book has solutions for the long term, not just the 21 days for the detox. This sounds like the solution for me! Yes having diabetes is no fun. Sugar can really wreak havoc on your body. I never realized how many foods have sugar in them and how much. Now it’s all about eating healthy and detoxing from sugar. Once you’re through the 21 days it’s all about eating the right foods that don’t constantly having you crave for sugar anymore. Diane’s book is a winner! Good luck! Awesome data about this arrangement to detox sugar from the body. Having excessive sugar in the eating routine can truly be hazardous to our wellbeing. It’s great to realize that this 21 day arrange does not just incorporate every one of the 3 meals for every day, additionally snacks. This arrangement is by all accounts a sound decision to replace a high sugar and carb eat less carbs. Sugar cravings are so hard to resist but sugar wreaks havoc on the body. The 21 day sugar detox is a great way of ridding sugar from your body and as long as you follow a healthy eating plan afterwards, things will improve. It is a good decision to stay away from sugar. Great content, I actually have a father who has diabetes and doesn’t know much about it, so it’s nice to stumble over your site and find such good info. I mean sure he knows about it but not to the extend at which you’ve explained and i can’t wait to feed him with this information to better his health. Thanks for such an excellent post. Thanks Tiffani. Sometimes we are just in denial. I know I was but I should have addressed the diabetes sooner. Catching it early enough is a life saver. My A1C was 11.3 and that is way too high! It’s now down to 9. So it’s all about choosing to take action to treat the situation. I hope your dad chooses to address it too. Either way, good luck! Nice website! Good info. for people who have diabetes or are looking to curb their sugar intake. Plenty of good content and visuals. I never knew sweet potatoes were so beneficial. I will try to enjoy my bottle of beer or glass of wine to control my blood sugar. You provide a lot of interesting content concerning ones sugar intake. I liked your “Lower Your Risk of Diabetes” page. Your recommendations are very helpful! Especially water. Water is overlooked by a lot of people. I hope you are successful with your website. Curbing your sugar intake is the most important thing to do for diabetes. Sweet potatoes are healthy and especially beneficial for controlling blood sugar levels. 21 day sugar detox is a great way to rid your body of sugar and get your diabetes under control. And people should never underestimate what water does for your body. Thank you for your comments! I had been doing some research into sugar and carbs in a bid to increase my energy levels, especially in the afternoons. And I agree that looking at labels is so important, I didn’t know how much sugar was in stuff that didn’t seem sugary. I thought I was all good because I didn’t drink fizzy drinks. How wrong I was! This 21 day detox looks like just what I need to get my body back into balance and back on track. Yes in 21 days you can detox your body from the excess sugar. I don’t think most people know or realize how much sugar is in everything we eat and drink. Once you are diagnosed with diabetes, then you sit up and take notice. The 21 day sugar detox is the way to turn your health around. Thank you for commenting! With the way that I eat and the fact that it runs in my family even my doctors were surprised I don’t have diabetes. I know I need to start taking better care of myself because I am not that young anymore and I’m wondering if this sugar detox would help me lose the sluggish feeling I seem to have a lot. I will definitely consider giving this a try, but I know it will be hard for someone like me who has a hard time giving up things. I know where you’re coming from Judy. But my eating did turn into diabetes for me. Now I’m doing everything possible to control and reverse diabetes. The 21 day sugar detox can help you rid your body of the excess sugar. This will also give you more energy. But it doesn’t mean to revert back to the way you were used to eating before. It’s easier to do this program than to try and treat all the symptoms from diabetes and other illnesses. Thanks Judy! You’re quite right that usually its not until something is diagnosed that we sit up and take a look at our diet. I am a firm believer that the root to many problems stem from the diet. The earlier we decide in our life to to take control of the diet the better! Wish I had known about this book when I did my 21 days of no sugar diet. Still think its well worth a good read though, thanks for the insight. It usually is noticed after the fact, right? And everything is always about diet and exercise. You don’t realize how harmful sugar is until you get diagnosed with diabetes. But a great start is to start the 21 day sugar detox diet. Let’s face it. Our bodies just do not like sugar at all! It does so much harm to our organs and our health. Time to detox the sugar with the 21 day diet. It’s well worth reading! It’s just insane how addicting sugar can be. I guess you don’t think about it much when you’re a kid, but eventually it catches up to you when you get older. It’s time for the 21 Day Sugar Detox Diet because all that sugar is toxic to the body. This book will help you detox from sugar the natural ways and help control your diabetes as well. I’m glad this was helpful to you! Thanks for commenting! I have been struggling with my sugar intake for years. I have been trying to break this habit but I’m finding it very difficult. My father is diabetic and I’m worried that I’m not far behind him. This plan seems like it would be a great option for me to start heading down a healthier road. Thank you so much for sharing! I will definitely look into the 21 day sugar detox. There are so many of us who struggle with sugar intake. It’s not an easy thing to detox from. But the 21 Day Sugar Detox Diet book can really help get the job done. The best thing you can do is to rid your body of all the excess sugar. This will help your diabetes and that’s important! As a retired nurse I do know about diabetes and the problems it brings with it when being untreated and the intake of sugary foods and beverages as well too much carbs can only backfire at some point. I am also interested in natural ways to reduce or even eliminate sugar intake of any sort and the the book “The 21 day Sugar Detox Diet” sounds very intriguing to me since we all like to over-do it on holidays. But, I also do believe that we can detox from sugar and 21 days seems to me a pretty good start. Thank you for your thoroughly written article it makes everything so much clearer to understand. It’s obvious to me that as a nurse you would know all about sugar and its’ negative effects on the body. There’s nothing more important than controlling your sugar intake especially if you are a type 2 diabetic. 21 days is a small price to pay in order to detox the sugar from your body. The 21 Day Sugar Detox Diet is worth reading and following because it works! It makes sense that your focus and energy levels and so much more improve as your sugar level begins to lower. I do believe that we all have the excuses that junk foods are convenient and that we are always too busy to have time to eat right, so yes it is a common excuse. Once we make the decision to detox ourselves from sugar, we will actually feel better both emotionally and physically. I am not diabetic myself but my colleague who is only in her mid-twenties is and already on maintenance. I wanted so bad to help her manage her condition by trying to gather as much information as I can on natural ways to lower blood sugar. I am not really against drugs and medications because I am well aware that once you have this disease, there’s really no means of eliminating it totally. But there are ways to control and manage it naturally, like a sugar detox. Reading your review of the 21 Day Sugar Detox Diet, I think the price is reasonable as it includes a guide and an easy to prepare 21 day sugar detox recipes . However, we live outside of the US so I am wondering how much would the total cost be if my colleague were to purchase the Premium package plus the shipping. By the way, I agree that while there are detox products we can avail, the best way to eliminate or cleanse ones’ self from excess sugar is a complete change in lifestyle. It’s tough to be diagnosed with type 2 diabetes, but especially when you’re in your mid-twenties. The natural ways to lower blood sugar are better than the medications that are prescribed. But one of the best things that can be done is to rid your body of all the excess sugar. I’m not really sure what the cost would be to purchase The 21 Day Sugar Detox Diet book outside of the U.S.
Amazon would have to give you that information when you go to purchase. I appreciate your comments. Thank you! For years now I have been addicted to sugar, because it’s a really hard habit to break. Shame on me I’ve known for years the dangers of consuming sugar and have ignored them all. I was just diagnosed with early signs of diabetes and Its leaving me with no choice but to detox myself. I honestly had no idea that someone created a detox program for sugar, it’s definitely worth giving it a try, because it’s really sad to say, but my life depends on it. I hear you. I’ve been there and I am there now. Breaking the sugar habit really is hard to do. That’s why I recommend the 21 Day Sugar Detox Diet book! We all don’t realize how the consumption of sugar catches up with us. I’m sorry you have the early signs of diabetes but right now is the time to detox! 21 days of detoxing sugar is better than a lifetime of diabetes! Im a diabetic and have never heard of a sugar detox. However it does sound like something our nutritionist should be suggesting. If not treated properly diabetes can be a death sentence so we need all the tools possible in our corners. Thank you for this great article. It sounds like a book I need to get. Yes, the 21 Day Sugar Detox Diet will help you to detox from sugar. Let’s face it, the more sugar we eat, the more it can build up. With diabetes, that’s the last thing our bodies need is more sugar. Diabetes doesn’t have to be a death sentence as long as you control it. This is a book that can really benefit you! Hi! Thank you very much for sharing this very interesting diet. Diane Sanfilippo seems to be a reference in this health section. In my research I found out she has been nominates for Goodreads Choice Awards Best Food & Cookbooks. I have read quite a few reviews and all are good. Our bad eating habits are so dangerous. I understand the importance of learning how to eat. And this diet is a great aid. I’m in! Diane Sanfilippo is the expert in her field of health. She definitely knows her stuff and that’s why the 21 Day Sugar Detox diet works. Sugar is dangerous and toxic. Her plan works and rids us of the excess sugar in our bodies. Time to get healthy again and feel better by detoxing the sugar!